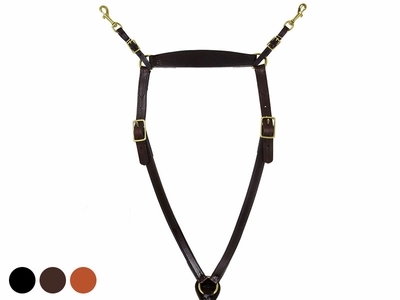 This heavy duty breast strap provides plenty of support to secure your saddle in the roughest country. 1" wide strap Double and stitched construction. Chest tab is lined with fleece. Black, brown, or Golden. Brass or chrome hardware. Horse size. Shoulder to center 22", center to girth 25".